Five star receipe, delicious! I do have a question, why does the breading stick to the parchment paper when I turn them to brown on the other side? I do not like a mushy crust. Wow I was somewhat iffy on exactly how good this would taste. Mostly I was concerned with crispiness. I did my own season blend in the bread crumbs and used olive oil on the chicken. Sprayed it with butter when I was done and put it on my oven stone. It came out perfect! Used 425 because your recipe said 425 and then somewhere else.it said 450. It definitely took 30 min at 425. I pounded the chicken with a tenderizer rather then cut the breast in half. After 25 min when it looked nice and golden I topped the children with some white line marinara (just like Rao’s or my homemade) some fresh basil and fresh mozzarella sliced. Accompanied it with spaghetti squash. Ideal light but flavorful dinner. Thank you for sharing. Found this when I was trying to find a WW version. Bravo – this is amazing! 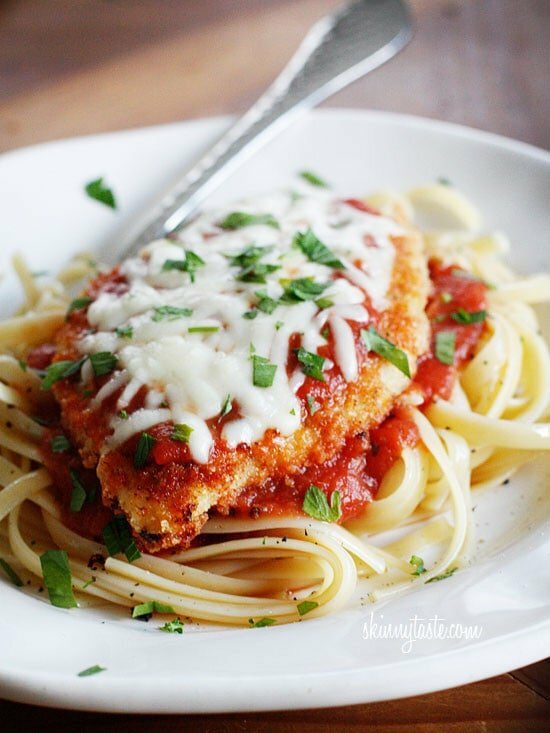 My husband said it’s the best chicken parm I’ve made which is surprising seeing as it’s the healthiest one. Thx so much for sharing this recipe. I made this yesterday for dinner and it was so much easier to make and healthier. The family enjoyed it! The only problem I had was the 450 degrees baking time. As the breasts were sliced horizontally making them thinner, I found the high oven temperature for 25 minutes way too high and too long. I took them out earlier and they were perfect @ 18-20 minutes.Will make this again. I started making this and realized someone did away with my marinara and mozzarella! I forged ahead and just made the breaded chicken cutlets and served it to my kids with ketchup and tater tots. It took no time at all and was very flavorful. I recommend. Making this weekend for a healthy cooking class with family members who need/want to learn how to cook. Is it in one of your cookbooks? Want to give away as a door prize! Thank you! I used a combo of panko and no-salt seasoned breadcrumbs with the grated Parmigiano. Melted a combo of butter and olive oil, brushed cookie sheet, seasoned each pounded half slice with salt and pepper and brushed them on the cookie sheet. Removed each one, coated each side in bread crumb mixture and returned to cookie sheet to bake. 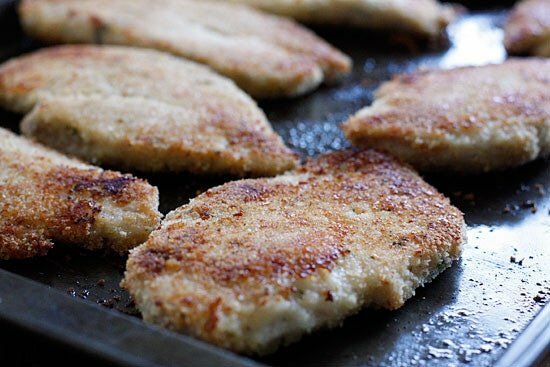 How would yo adjust this recipe for veal cutlets? Should work fine with no adjustments. Gina, my whole family loved it! Been trying to get my very picky 16 year old to eat a bit healthier, and this was a start. Baked them at 425 for 20 minutes, then 5 minutes more with the sauce and cheese. So good! Thank you! This recipe was delicious and very easy to make. I followed the recipe exactly and the chicken was moist and delicious. My non-WW husband enjoyed it and said I can make it anytime!!! This is a keeper in my house!!! Hard to get the breadcrumbs to stick!!!! Did I do something wrong? One of our favorites! I make it in the copper in my convection oven for 22 minutes at 450. Nice and tender and crispy! This was the absolute best!!! I did everything the recipe called for accept I used trader Joe’s mozzarella. Perfect!! Thank you so much for your recipes! Absolutely delicious! I used six 5oz (three ~11oz breast halved after pounding to 1/2” with mallet) chicken and the recommended 425°F and 20 minutes, flipping the chicken at 10 min. Added sauce and cheese and the additional 5 min. Replaced bread crumbs with Colonoa panko flakes and added Italian seasoning. The chicken came out so tender and juicy. Thanks so much for sharing. This will surely become a regular in the dinner rotation. Hi! I bought thin sliced chicken breasts to make this dish tonight. Can anyone recommend how I should adjust the timing/temp? Thank you in advance! We’re so excited to try this recipe! EXCELLENT! split the chix breasts as noted to make them thinner. 425 for 25 minutes and they were perfecto! A new favorite recipe…i am so happy! So good! Made this tonight and will definitely make again. I had it with spaghetti squash and Caesar salad. Delicious ! Very easy to make, even for those on a tight schedule. I’ve made it many times and we love it. Info into the WW calculator. I use freestyle, any idea why that may be. Not just this recipe but others as well. Hi Nailah. The only accurate way to determine any recipe’s SmartPoints® value is to plug the ingredients into the recipe builder on the Weight Watchers website (Click on “My Foods,” select “Recipe,” and click “Create a recipe.”) which does not count fruits and vegetables in recipes in the calculations as they are now 0 points. I have Freestyle and put in the nutrition information in the calculator…I got 5 points per serving too, not 4 as the recipe states. Delicious, though, so worth it!! Made this for the first time and it was so easy and delicious. I used a store bought pasta sauce since that’s all I had. I have a convection oven, so I set it for 450F (my oven automatically puts it down to 425F) and after reading some of the comments, I baked them for 10 minutes and then another 5 minutes after the sauce and cheese were added. They turned out perfectly moist! I will definitely be making this again. Really tasty! I use the point system and my husband had no idealIt was a healthy option for dinner tonight. So glad I tried it YUM!!! is the pasta included in your point reference? The baked chicken paremesan is FANTASTIC!!! I didn’t even add the cheese on top and I could have eaten the whole pan!!! Definitely making this in a regular basis….thank you! My wife doesn’t like marinara sauce so I used Ragu garlic parmesan Alfredo. Put the remainder over egg noodles. I don’t know what this alteration did to the numbers but wow it was a good meal. Has anyone used almond meal as breadcrumbs with these? 425 for 23 minutes then taking out for sauce and cheese works great for us. If you want to add a few mini turkey pepperoni or olives under the cheese its a nice finish as well. This recipe is just bulletproof. Thanks G! Just made it for the first time tonight. It was so good. The only thing I changed was I added a little garlic powder to the melted butter and I baked it at 425 for 25 minutes. Definitely going to pass this recipe on to family and friends and will most definitely be adding it to my book of recipes as well. Hi Gina! 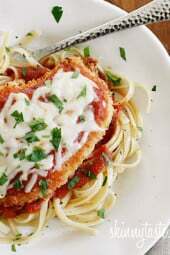 I love making this chicken parm & wanted to be able to make a dish of it freeze for after my first baby is born. Any guidance on how to freeze/reheat? Thanks! Sure, you can freeze in freezer safe container and just pop them in the oven 350F until hot. We loved this! I used the convection roast setting on my oven following the recipe instructions (except for putting it back in with the sauce for the last 5 min. since convection is slightly faster and it was clearly done)and it turned out beautifully! We all loved it.. I think this will be on regular rotation! Thank you for the great recipe. I’m just getting into cooking things ahead and freezing them — for your freezer friendly recipes it would help if you could add instructions about the best way to freeze them and then reheat? And what should be made that day rather than froze? (assume the pasta?) Thanks. I baked mine on 450 and the bottoms were burnt. However, I’m sure my execution was not precise. I pounded my breasts to 1/2 inch thickness and cut them in half. I only had pre-grated Parm instead of freshly grating it myself. Your pictures look scrumptious and I wish mine came out the same lol. This is a good recipe. I think it can produce some really tasty chicken Parm once one perfects executing it. Delicious, we all loved it. Made this tonight, another fantastic recipe!! I used egg before dipping in the breadcrumbs and eliminated the olive oil/butter, I also subbed in FF mozzarella cheese and it came out great (I am on WW and it saved me a few points). Baked at 450 for 20 minute with thin cut chicken and it was perfect. so good! I added a little garlic powder as well. I cooked at 425 for 23 minutes. took it over covered with sauce and mozzarella and broiled it for a few minutes until the cheese was melted. Looks great! Can you freeze this recipe before baking or would it be better to bake and then freeze? Thanks! If you were preparing this to freeze, can you please tell me how you would do that and what the reheat instructions would be? I made this last night and my very picky five year olds loved it! My husband who loves chicken parm also loved it. So another successful SkinnyTaste meal!! What is cooking spray? Is it an olive oil? I used 450 for 25 minutes. My chicken was done and moist on the inside. I had so many good comments about how good the chicken is. I will use this recipe again! I used the olive oil to coat the chicken before breading. I also coated the baking dish in olive oil to prevent sticking. 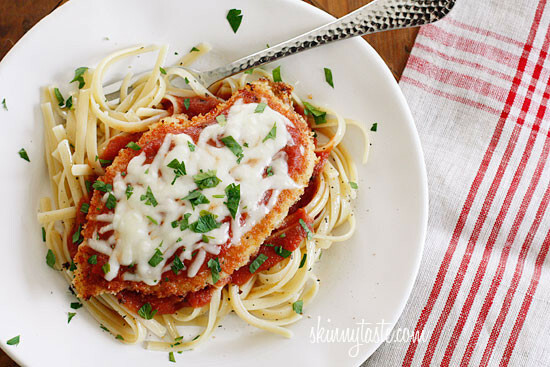 This was the first time I made chicken parmesan and I loved it! Hello it says to cut lengthwise but the pieces of chicken all look small and the same size like they were cut crossways? Making this tinoorw and is love to know. Can this recipe be put together the day before, refrigerated and baked the next day? This was so easy and delicious!! I used boneless skinless thighs and added some panko to the breadcrumb mixture for extra crunch. 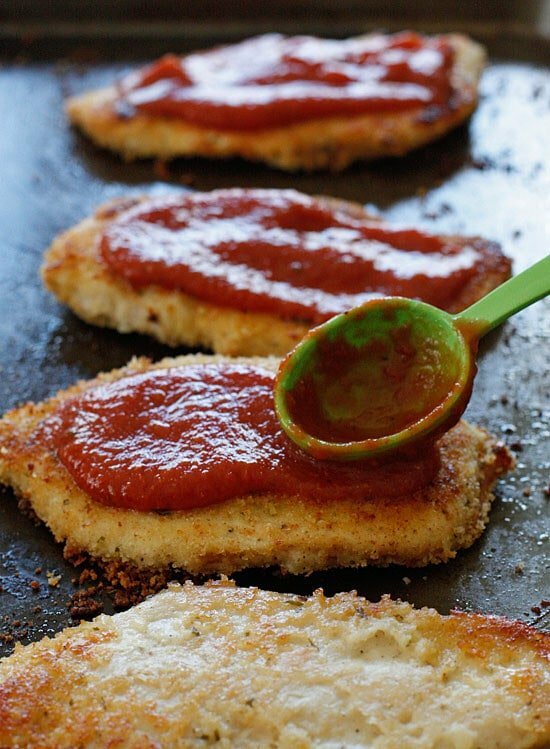 Will definitely be my go to for chicken parm from now on. The butter instead of egg!!! Genius move! Tasted amazing. Definetly reusing that idea again. IF I use tomato sauce instead of marinara – does the SP change – I am on Freestyle? Great recipe! I subbed the butter for Italian dressing and it turned out great! I loooove this recipe! I wish I hadn’t cooked it for the full 25+5 minutes at 450°, waaay too long and it over-cooked. :(I used EV olive oil and subbed Panko bread crumbs, Parmesan &added black pepper.I didn’t have marinara so I subbed Prego Spicy Sausage sauce.Used shredded mozzarella.I served it with quinoa &brown rice instead of noodles. Made this recipe today. It was fantastic. I would definitely cook it at 425 next time. The bottom got a little burned at the 450 temp but it didn’t kill the meal. It was super delicious and will definitely move into the meal rotation. Has anyone make this successfully with a gluten free flour and if so, which type? Thanks! Almond meal should work well. I don’t understand your question. 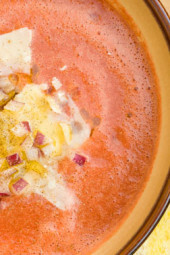 The green spoon is a tablespoon and the picture is from her website – you can see the credit. Any suggestions or ideas or what would the time/temperature be in the air fryer?? This is one of my husband’s favorite recipes. I am on WW, not him. But he will gladly eat this any time I make it. 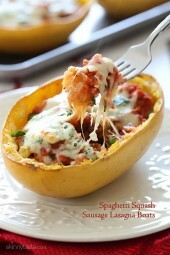 I love it with spaghetti squash. This has been a go-to in my family for about 2 years. Everyone likes it(including the picky one) and it’s easy to make extras for my husband who LOVES leftovers. I’ve made this recipe numerous times and it’s always delicious! I substitute ingredients as well. Last night I used coconut oil instead of olive oil or butter. You can use whatever bread crumbs you wish. I used talian bread crumbs. My husband is a very picky eater and he loves it. Definitely a staple in our rotation. Any suggestions on how to bake this in an air fryer?? Love this recipe my kids asked for seconds !!!? I made this time and time again, although I do pound down the chicken so it’s nice and thin and not cook it as long. I loved this recipe. My daughter dislikes chicken and since I am on weight watchers, we eat chicken a lot. This was great for her to eat and she loved and so did I. Delicious. 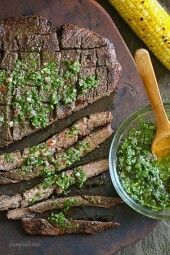 Is this a photo of this recipe? That looks like more than 1 T sauce and 1 1/2T cheese!! Why are you using the “chicken permission” pic here? Or did that person take the photo from you? If that is your picture, what’s with the green spoon? It is 100% Gina’s picture. And what do you mean by what is with the green spoon? She used it to measure and spread her marinara…. Made this tonight for the 1st time tonight & everyone loved it! I cooked it on 425 for 25 minutes like it said and it turned out great. It’s definitely a keeper! Thank you! Bake at 425 or 450? Two different instructions given. Thanks. Anxious to try this way rather than frying. Whoa. I should have followed my instincts and not used the oven temp that is stated in the recipe: 450 degrees is WAY TOO HIGH for thin-sliced chicken breasts! Mine were burnt on the bottom and all dried out when I took them out after 25 minutes. Also, the recipe says 450 but in the notes about how to make “perfect chicken breasts in the oven” it gives a temp of 425 (still too high). I have made WW recipes with regular chicken breasts (i.e., not thin sliced) that cook for 30 minutes at 350. I normally love your recipes, Gina, but this was off the mark. Sorry. 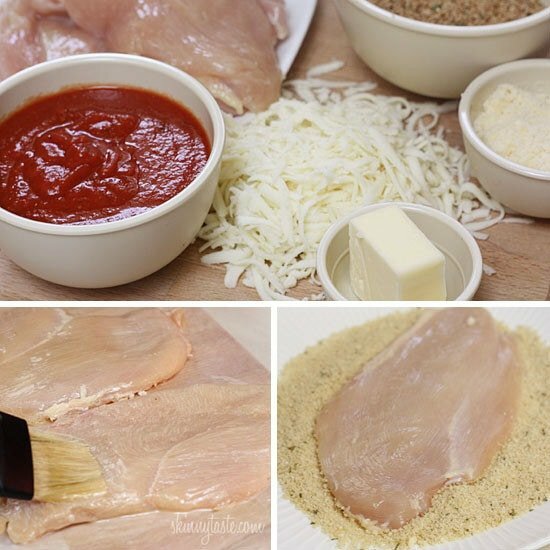 This recipe does not call for thin sliced breasts. Perhaps that was your problem. I take a full size breast and cut it in half. … in fact you SPECIFICALLY reference thin breasts: “Cutting the chicken in half lengthwise speeds up the cook time and tastes better than if you leave it whole. This THINNER breast takes about 25 minutes to cook.” Why reference a thinner chicken breast after cutting it if it isn’t supposed to be thinner? Note: pre-cut packaged ‘thin sliced chicken breasts’ VS chicken breasts cut in half lengthwise will have different thicknesses. I think she meant after cutting one regular breast in half, no matter some people aren’t experienced cooks so it would be helpful to correct the 425 to 450 or vice verse, one is a typo.. Just had for dinner fantastic! Husband said it hit the spot! I had chicken breast that I had cut in half and then sliced the long way so they were more like quarters. I did 450 for 20 minutes and then an additional 5 after putting the sauce and cheese. They came out perfect! At the beginning it says heat oven to 425 for crispy crumbs but then in the recipe it says 450. I think I will use 425 as my oven tends to bake a little hotter than it says. Very easy to make and tastes incredible!